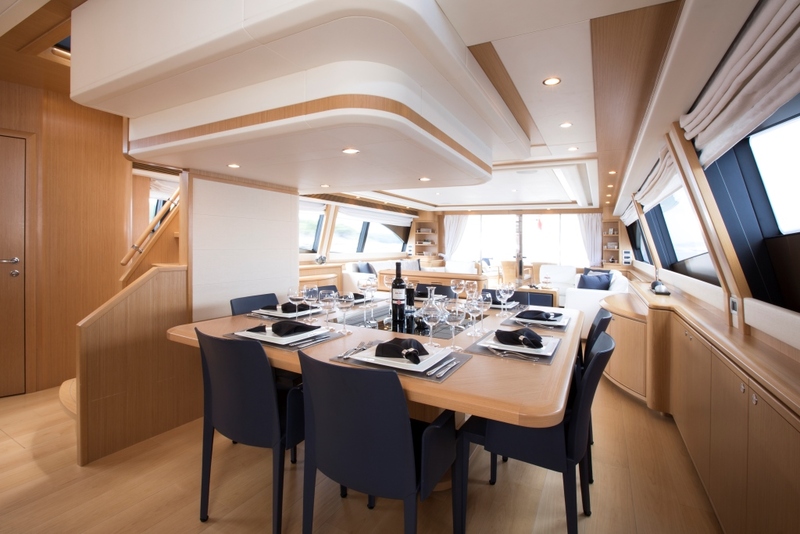 PORTHOS SANS ABRI is a Ferretti 881 model that was designed by the well renowned Italian shipbuilders Ferretti and launched in 2012. 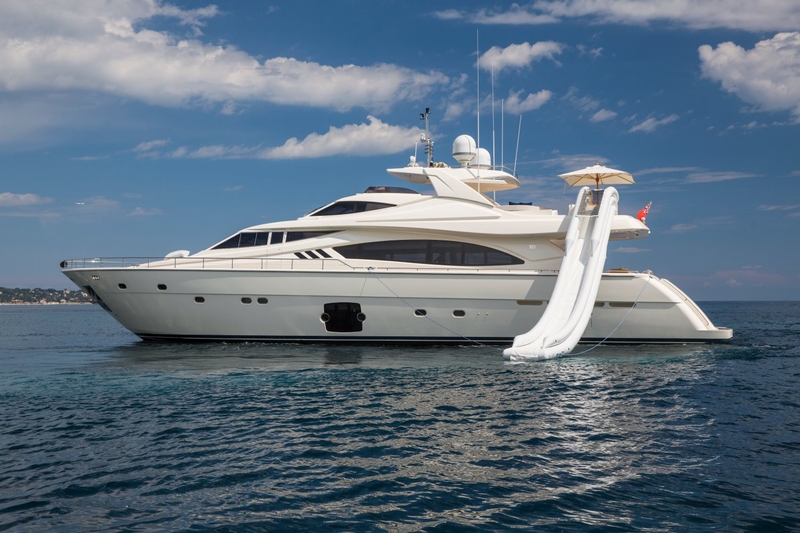 Measuring 27m (88.7ft), she is the ideal yacht for families and groups of friends, offering accommodation for up to 10 guests in 4 generous cabins. 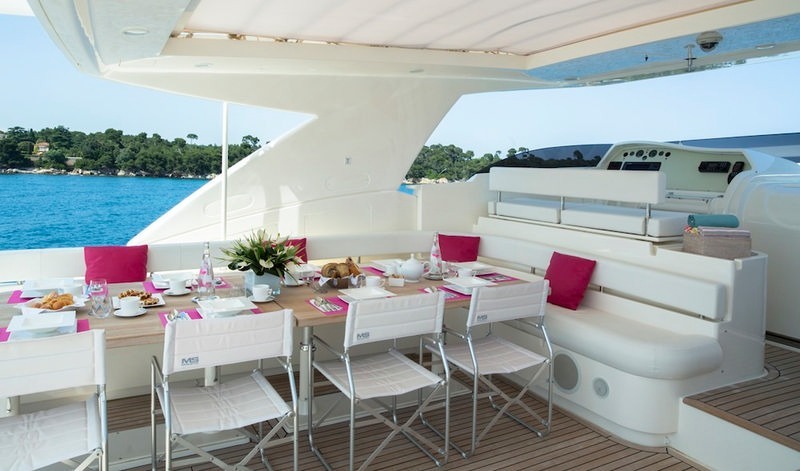 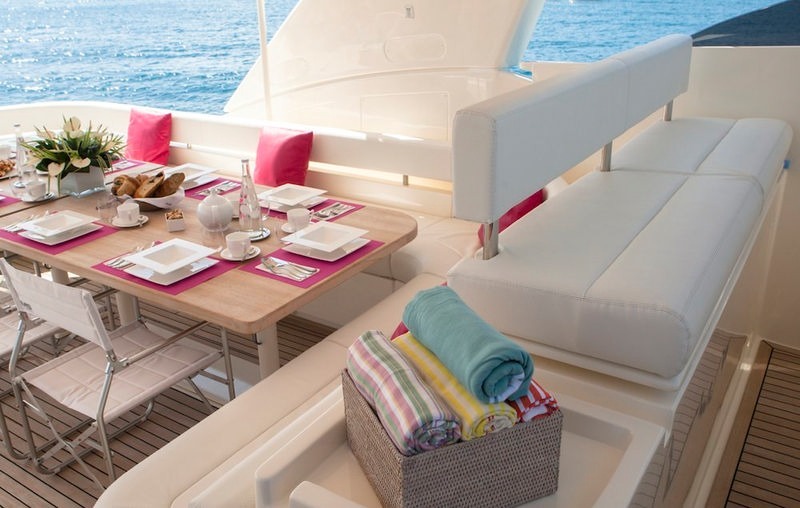 PORTHOS SANS ABRI boasts an elegant and contemporary interior. 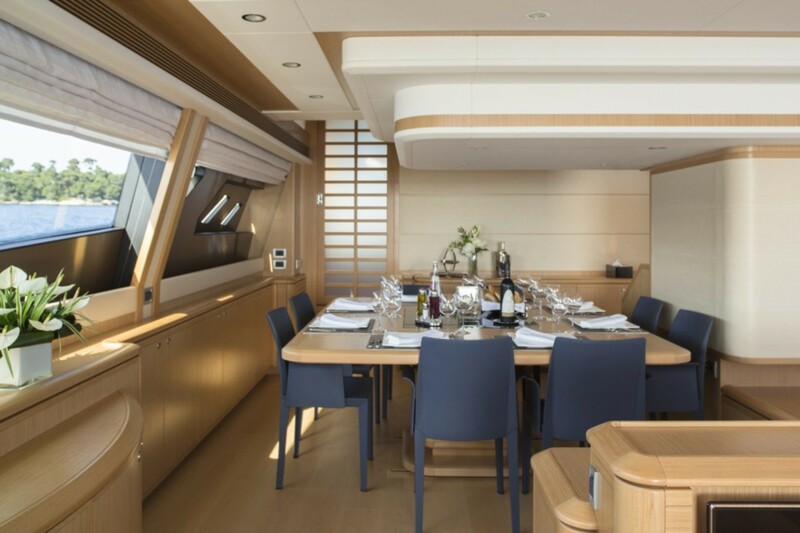 The salon is an open plan maximizing the use of the generous space offered. 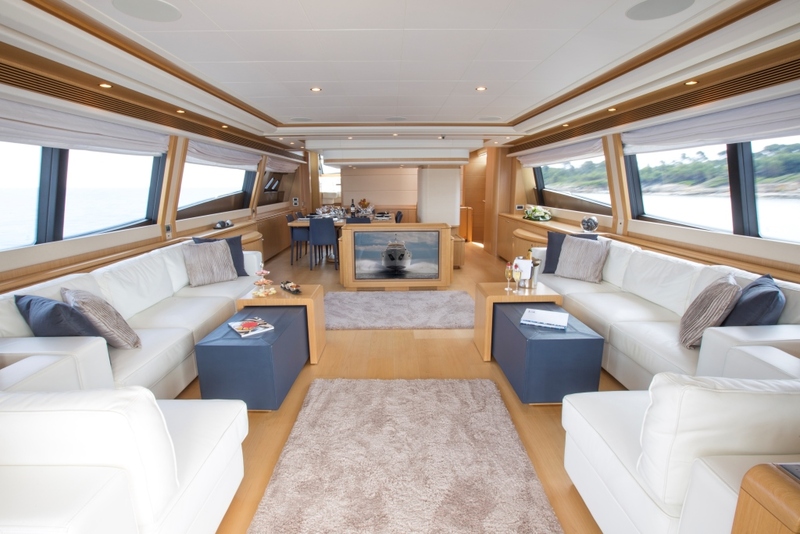 The lounge is aft and features 2 plush leather sofas, coffee tables and ottomans. 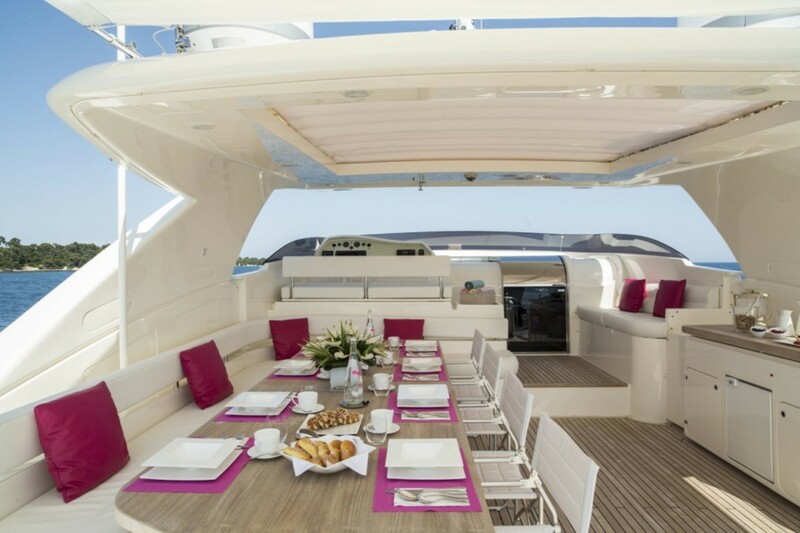 An island credenza creates a casual separation for the formal dining table forward while housing the full entertainment system and large flat screen TV. 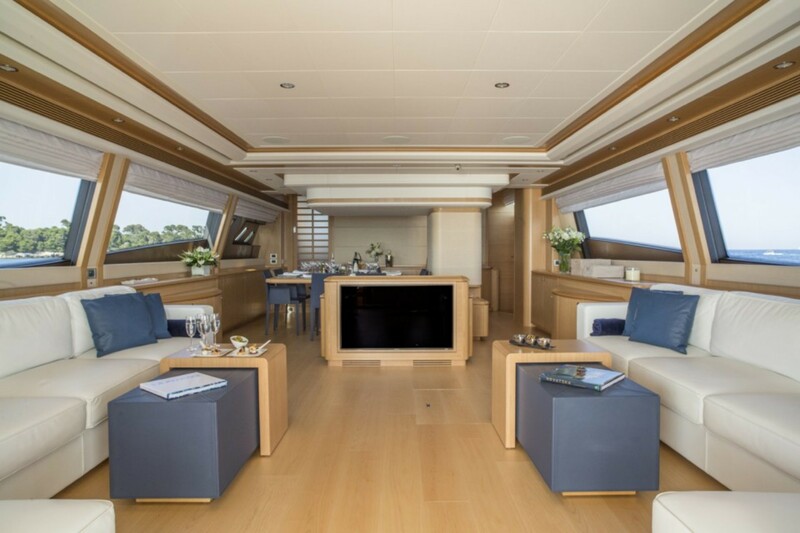 Panoramic windows illuminate the high quality finished wood floors and overall stylish ambiance. 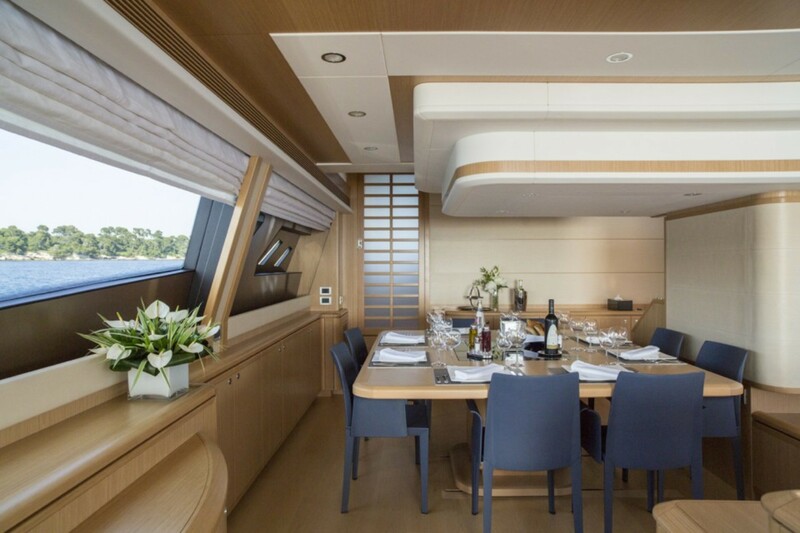 Exterior living is plentiful aboard PORTHOS SANS ABRI. 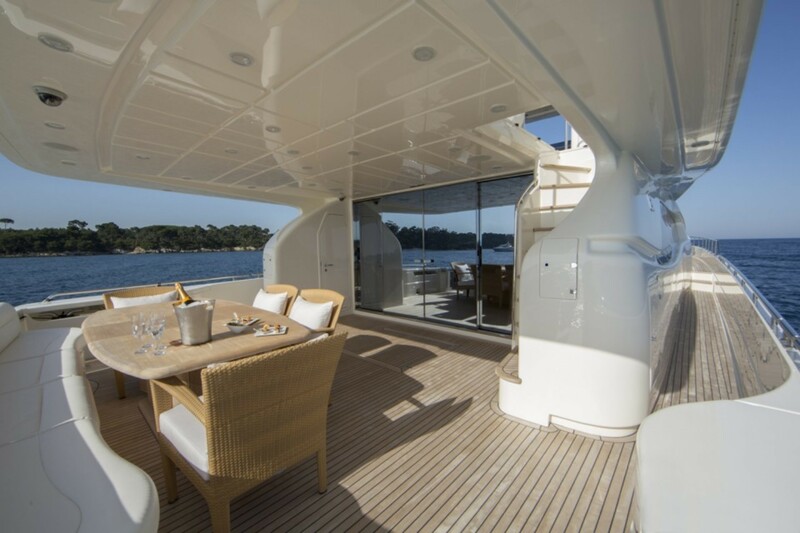 The aft deck is adjacent to the salon through wide sliding glass doors and offers built-in seating and a shaded alfresco dining option. 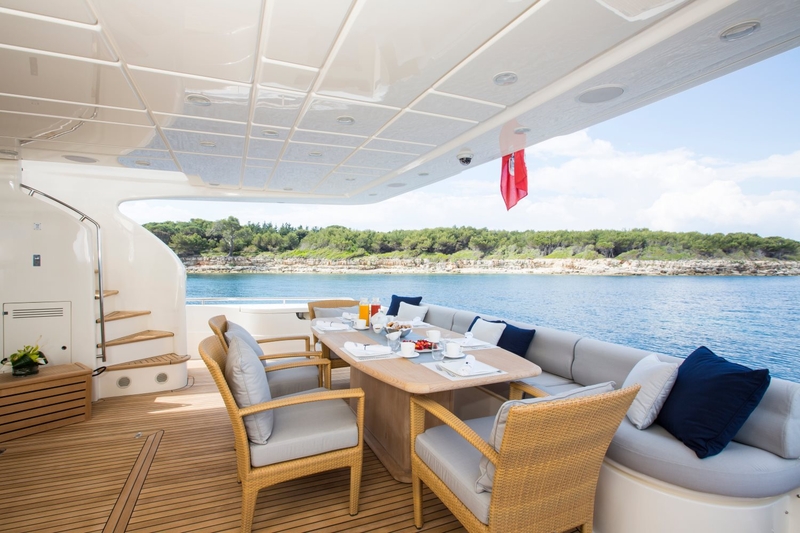 Further aft, steps continue to the extended swim platform and teak beach, perfect for the water enthusiasts in the group, to make use of the array of water toys available. 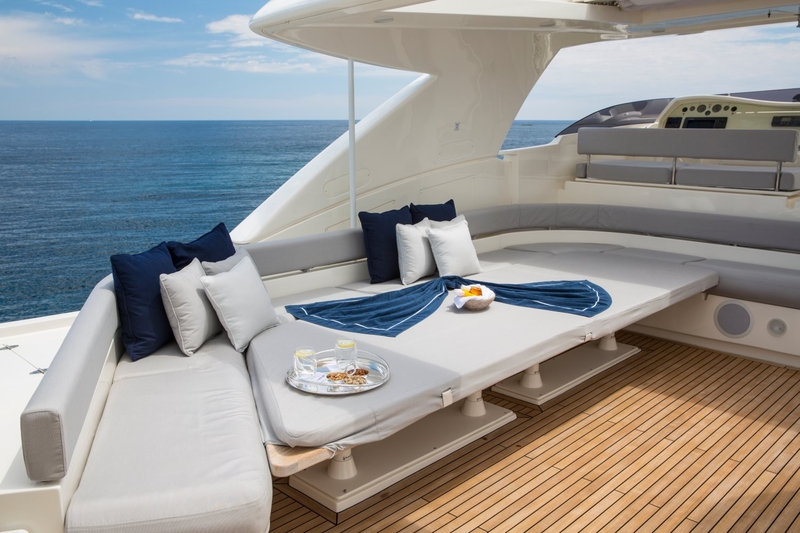 There are 360° wrap around decks, making access to the foredeck effortless, where a large double sunpad is ideal for an intimate escape, or simply a relaxing moment. 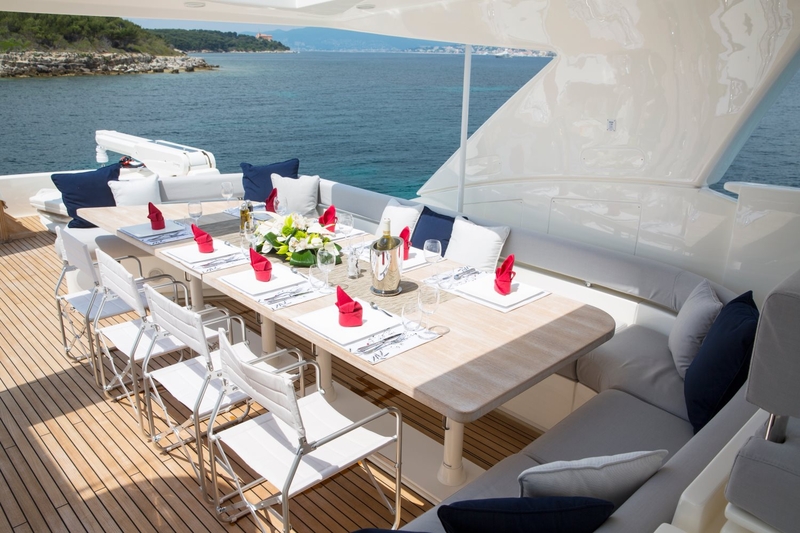 Above the main deck, the yacht boasts a spacious Flybridge complete with partial shade, alfresco dining option, ample seating, bar and service area, and sunning space, perfect for entertaining by day or night. 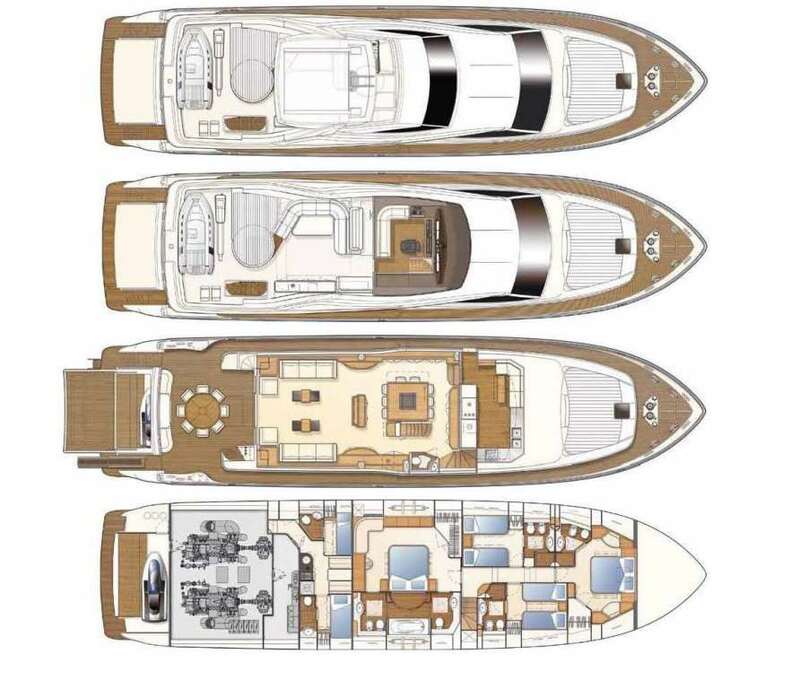 She has a beam of 6.7m (22ft) and a draft of 2.2m (7.2ft), and is powered by 2 x 2435hp engines with cruising capabilities of 22 knots and top speeds of 29 knots. 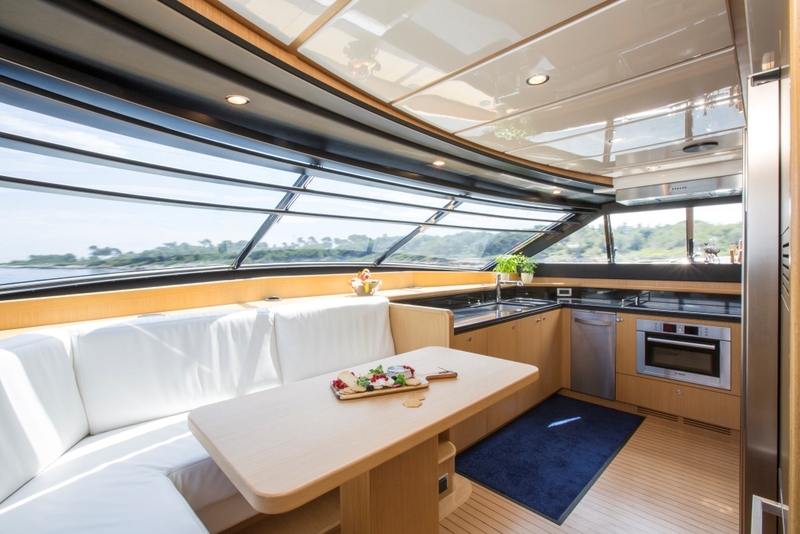 Thanks to the Mitsubishi stabilizers, PORTHOS SANS ABRI ensures a comfortable trip for her guests. 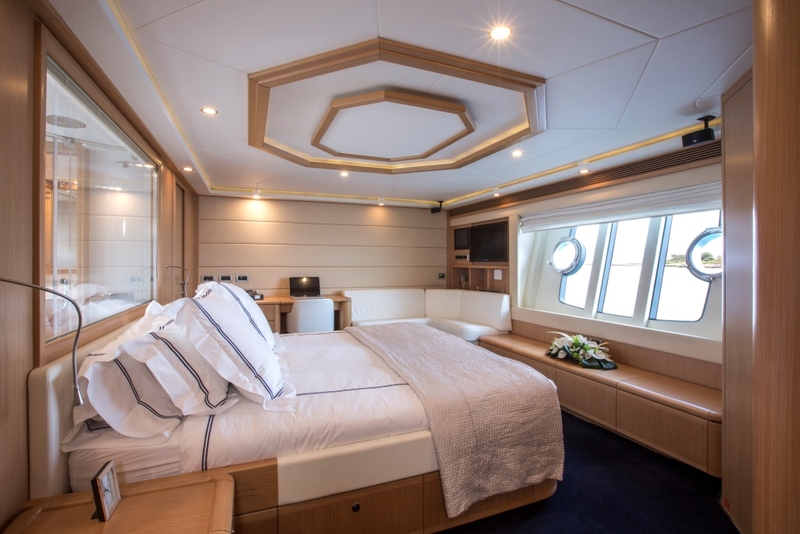 PORTHOS SANS ABRI features deluxe accommodation for up to 10 charter guests, in 4 generous cabins. 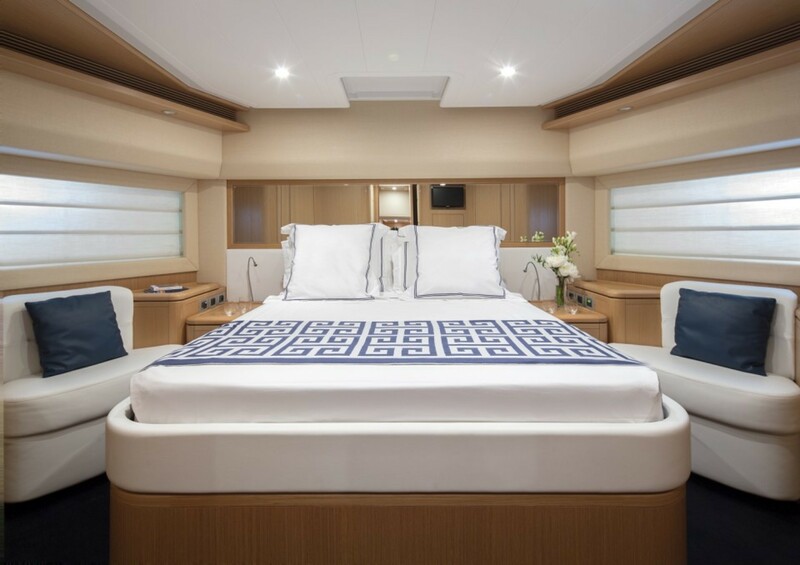 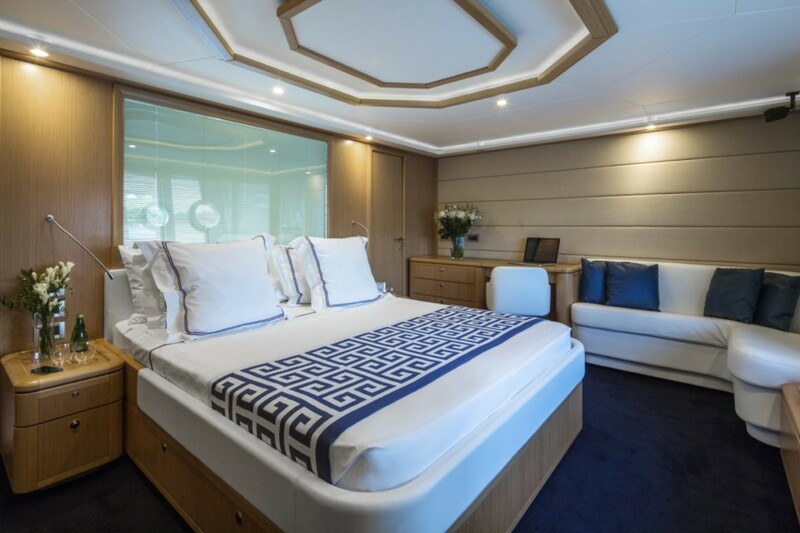 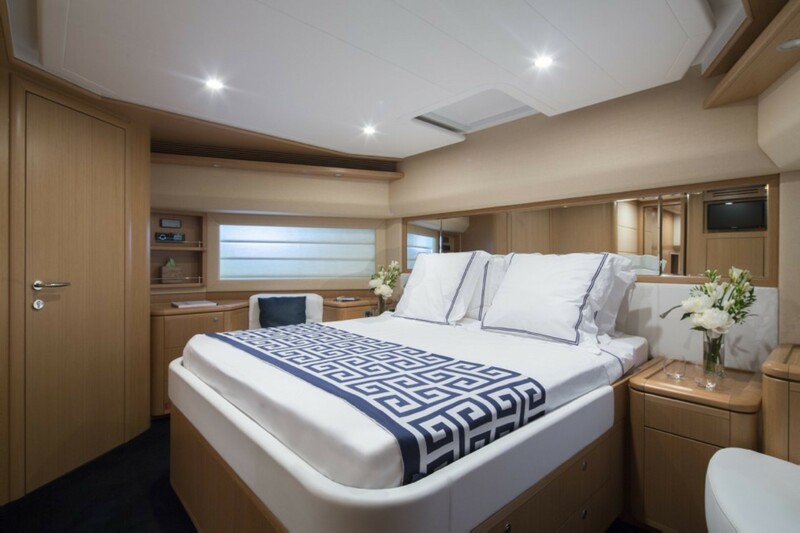 The master suite is amidships and full beam of the yacht with a centered queen size bed facing outwards, to enhance the spectacular ocean views. 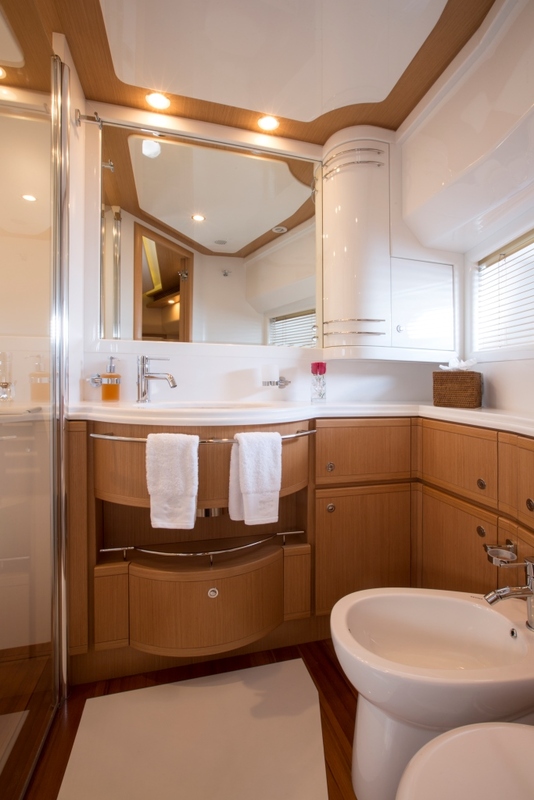 The cabin has a small settee, vanity and full entertainment system. 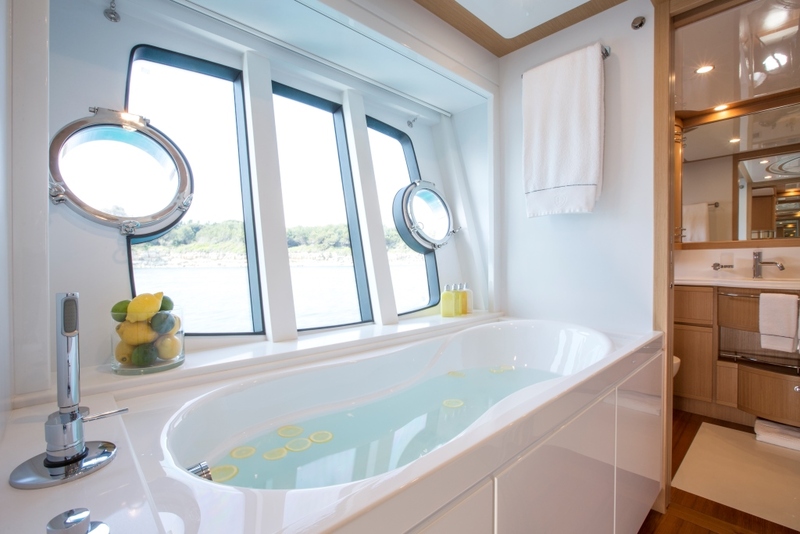 The master suite boasts a large en-suite with a dual rain shower, bath tub and further idyllic views from another large window, in the port hull. 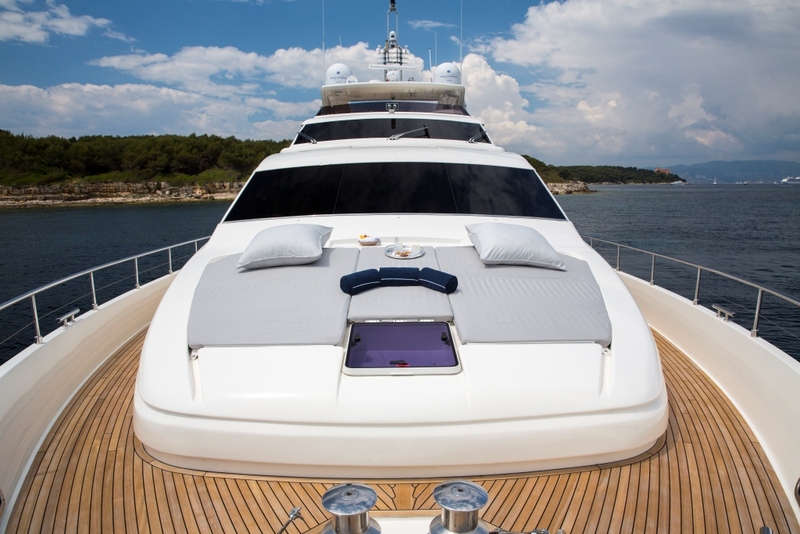 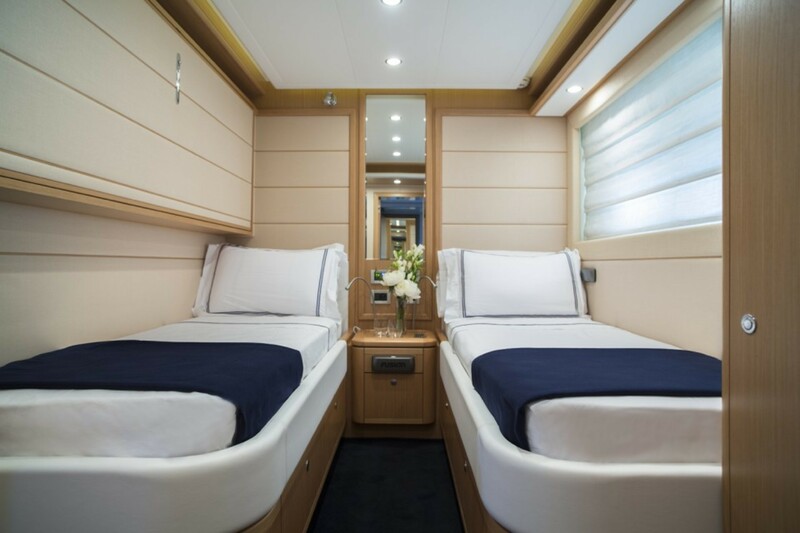 Forward and full beam of the yacht is the VIP cabin offering a double bed, seating and full entertainment. 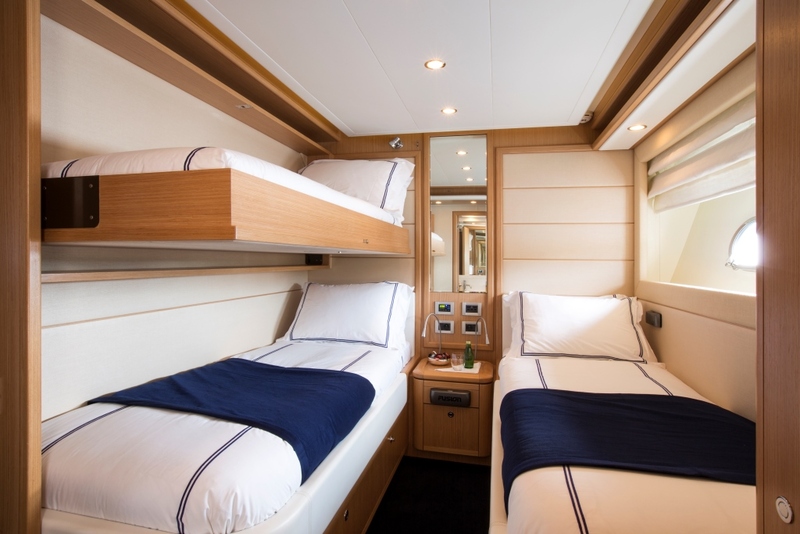 Two guest cabins are on port and starboard with side by side twin beds, a Pullman berth each and music entertainment. 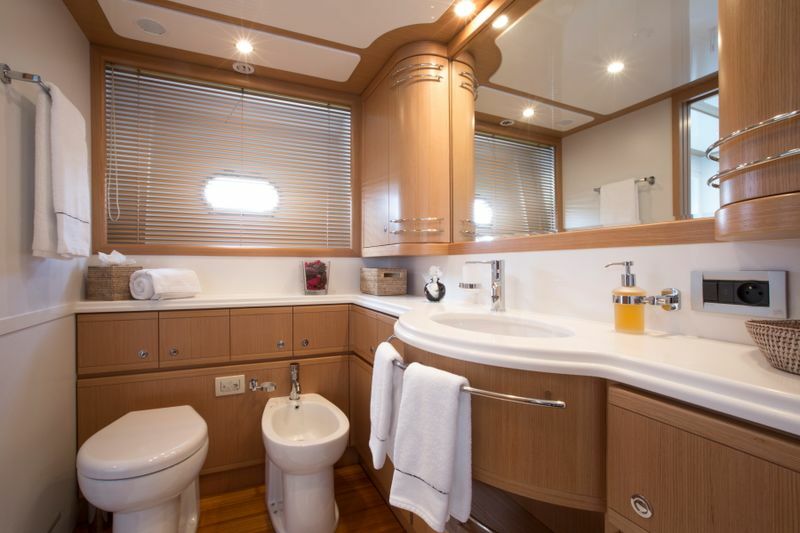 All 4 cabins have private en-suite facilities and feature a welcoming serene nautical atmosphere. 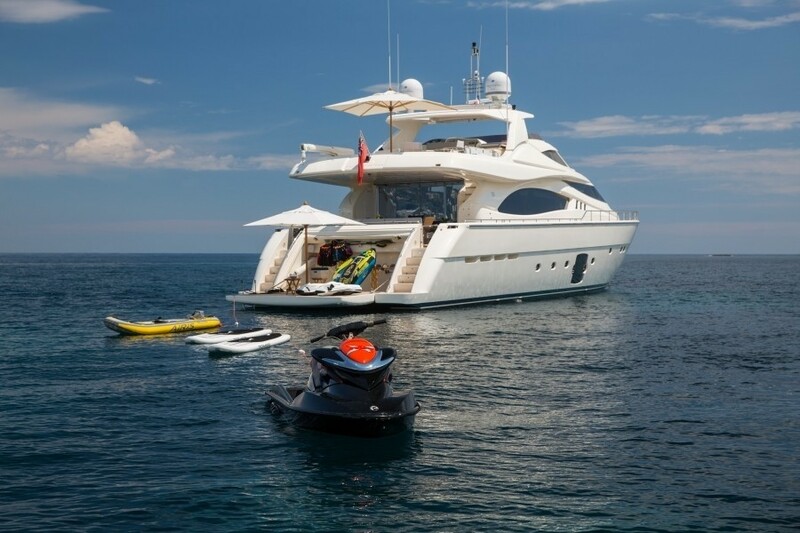 Tenders & Toys onboad SANS ABRI include a 4.20m 50HP Tender, 2 Seabobs, a Seadoo 2-seater Jet ski, 2 Inflatable paddle boards, a banana, 1 waterslide, 2 Inflatable kayaks, Assorted snorkels & fins. 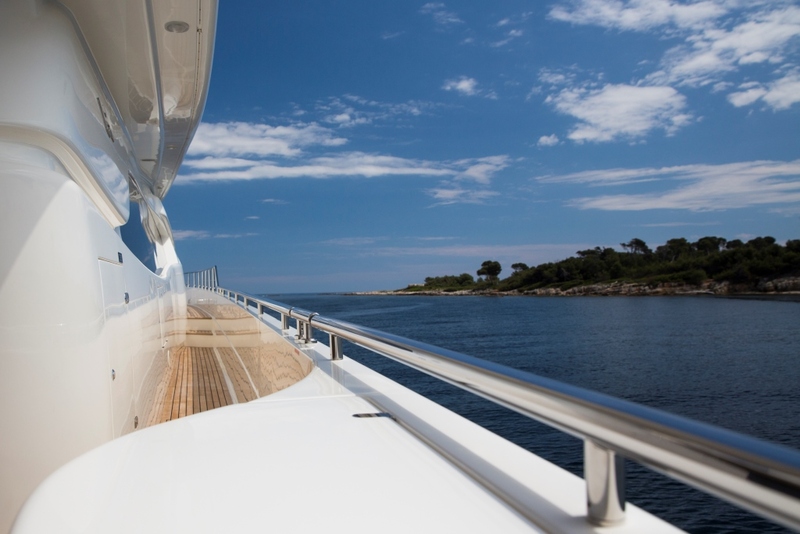 Communications: There is WIFI available in all areas of the yacht. 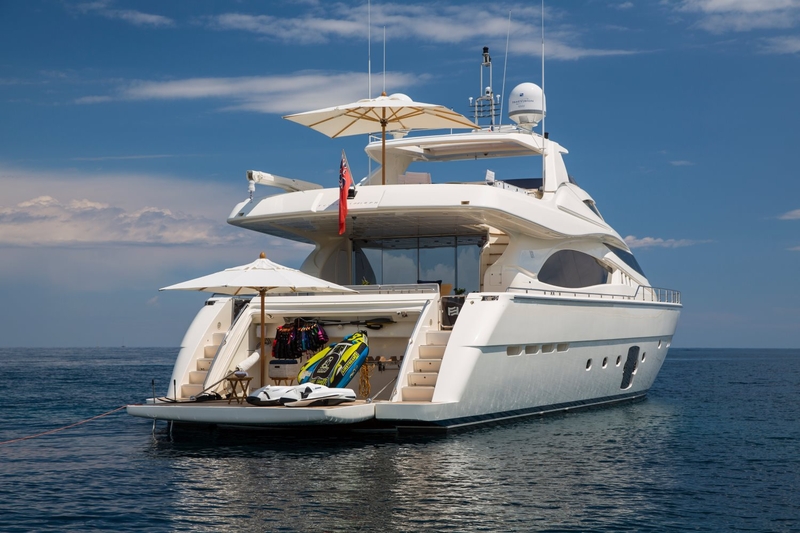 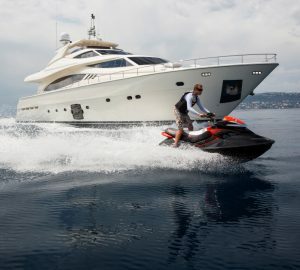 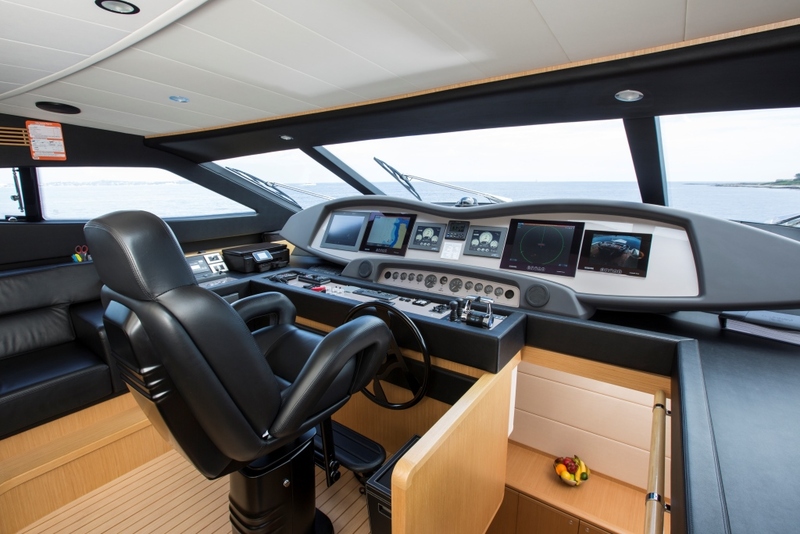 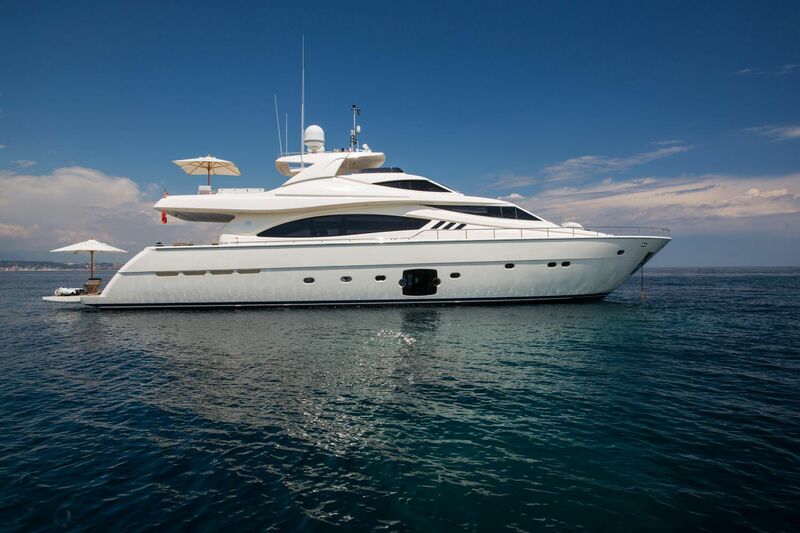 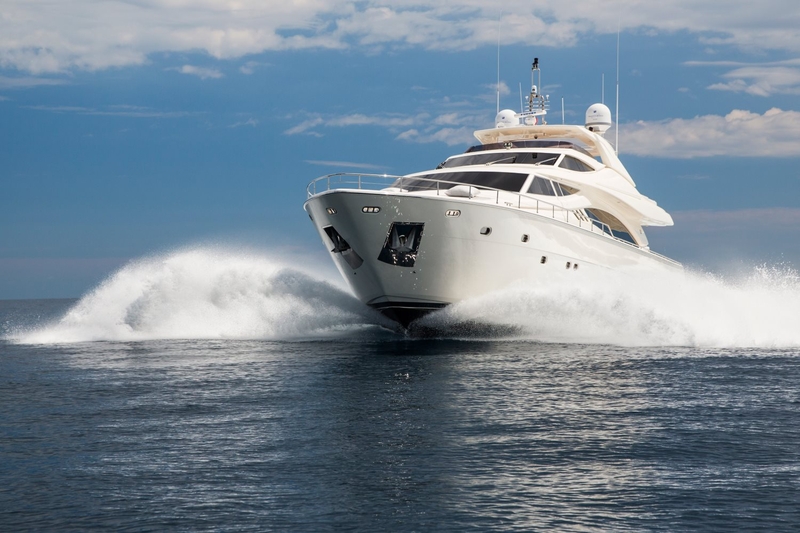 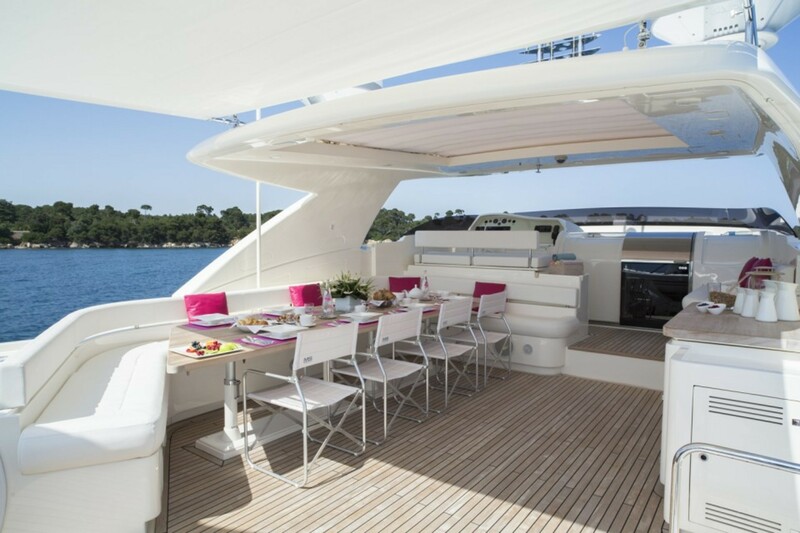 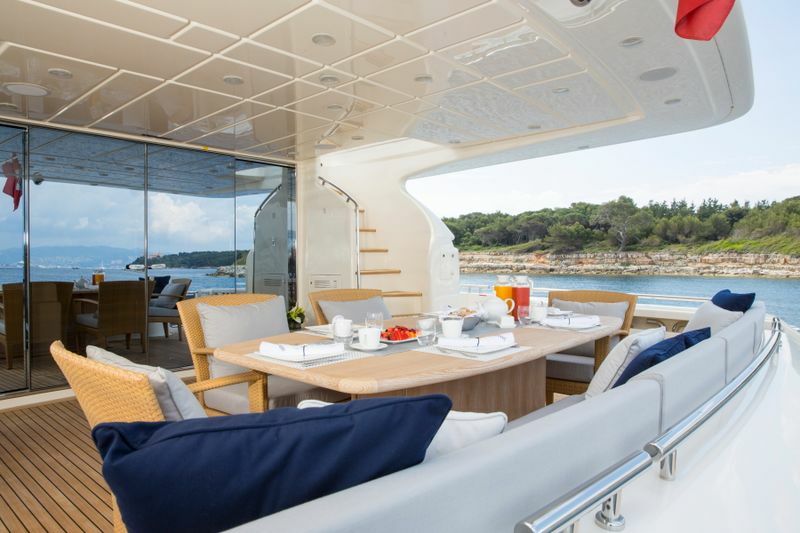 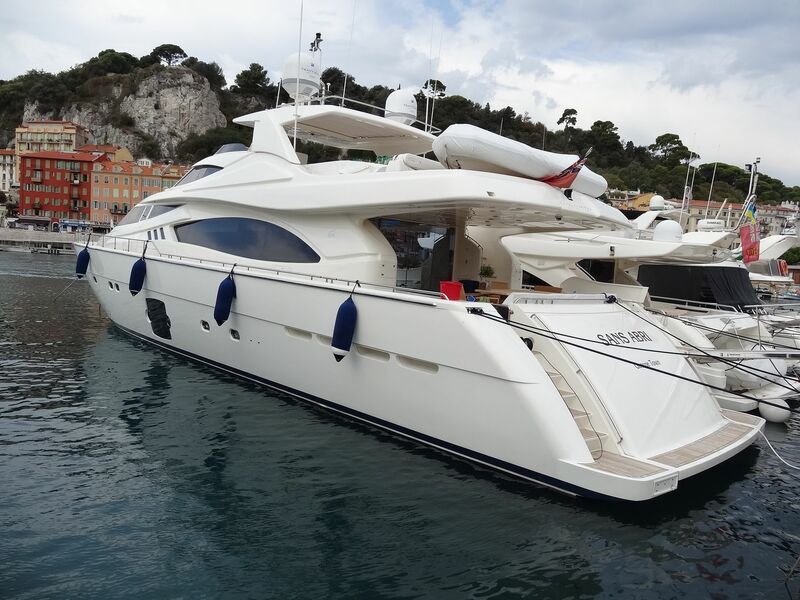 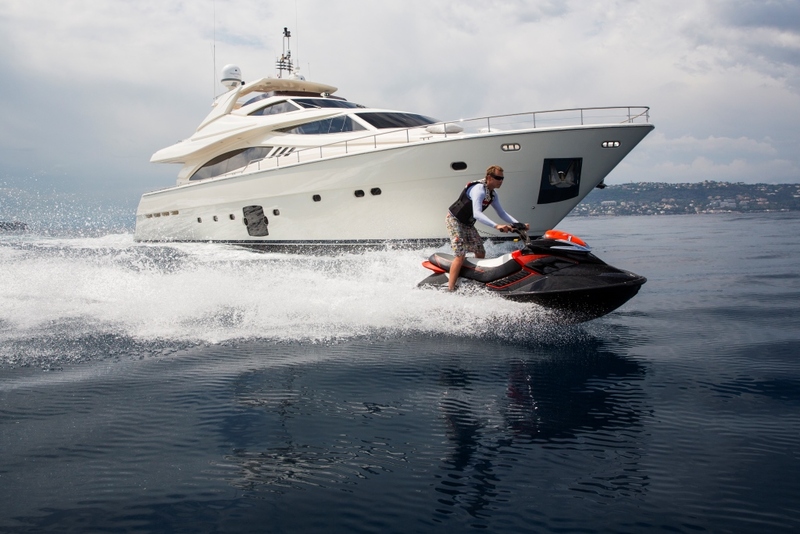 Audio Visual Equipment and Deck Facilities include Saloon - Large Samsung flat screen TV: 47" Fusion HiFI system which connects wirelessly to your iphone (or wifi enabled iPod) and streams audio to public areas of the yacht including the deck areas. 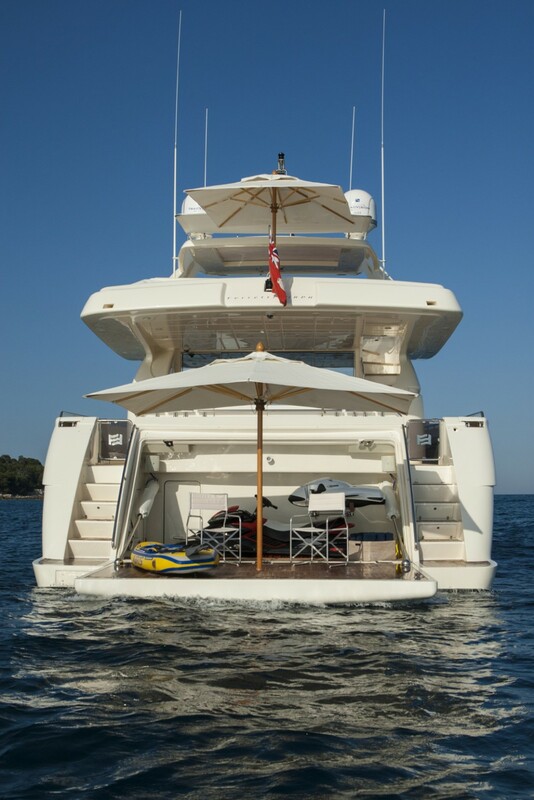 This hifi will also play DVDs through the large flat screen TV. 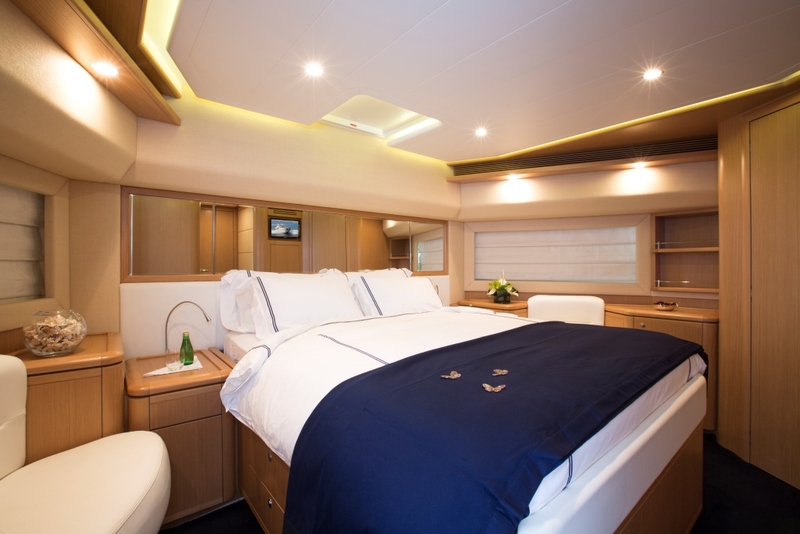 Master Suite - Flat Screen TV:20" Bose speakers and Radio/DVD/CD player which will stream to the TV. 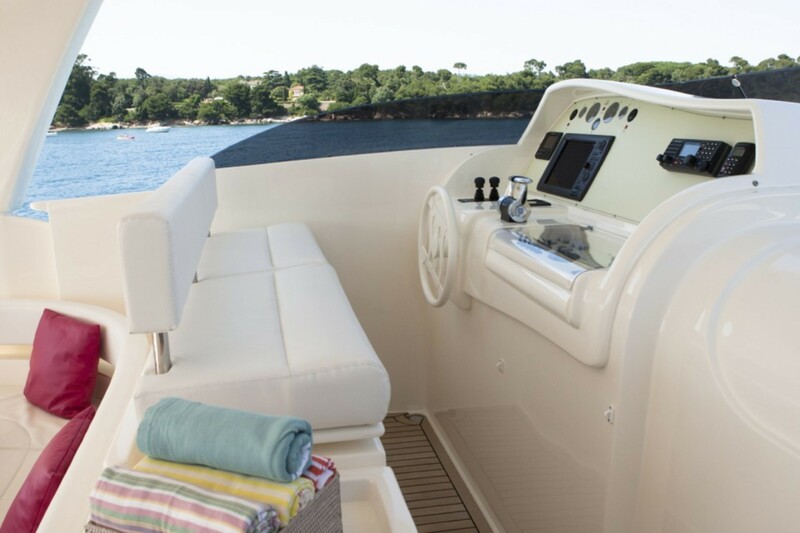 Ipod dock is also connected to the same system and will play music through the Bose speakers. 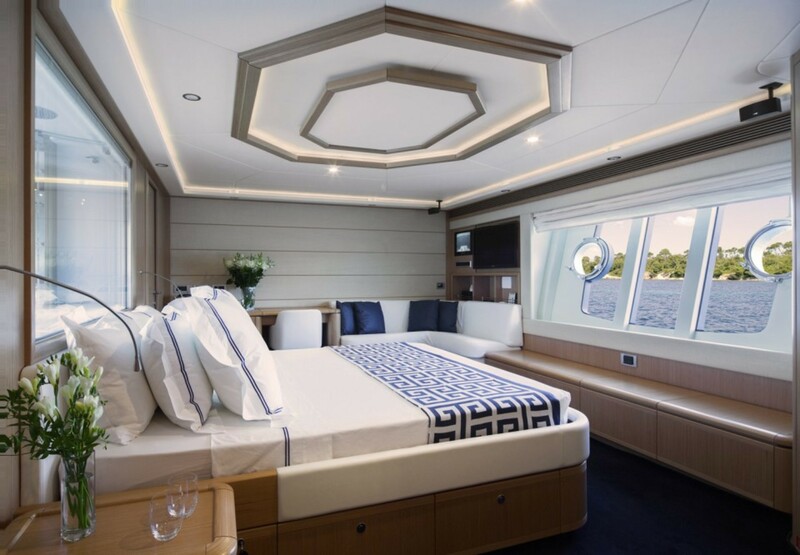 VIP Suite - Flat Screen TV: 17" Ipods can be connected to play music through a docking station build in to the wall and there is an additional charter on the bedside. 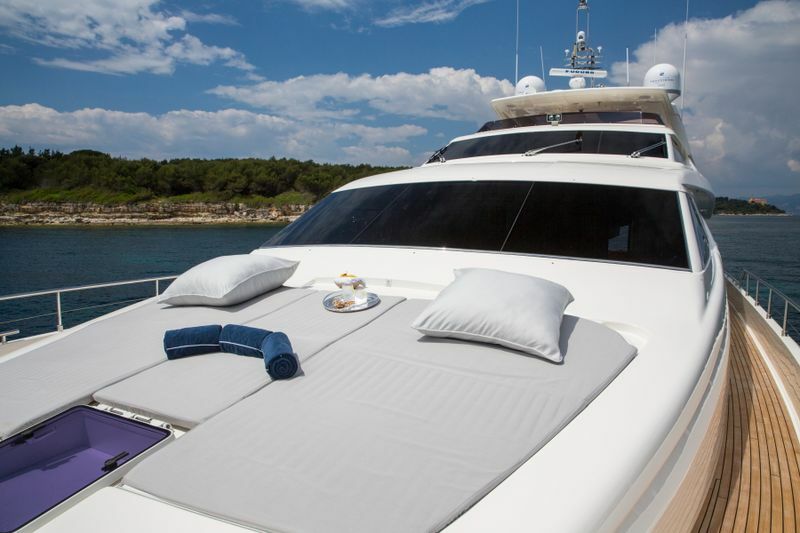 DVDs can be played through the TV using the same docking station. 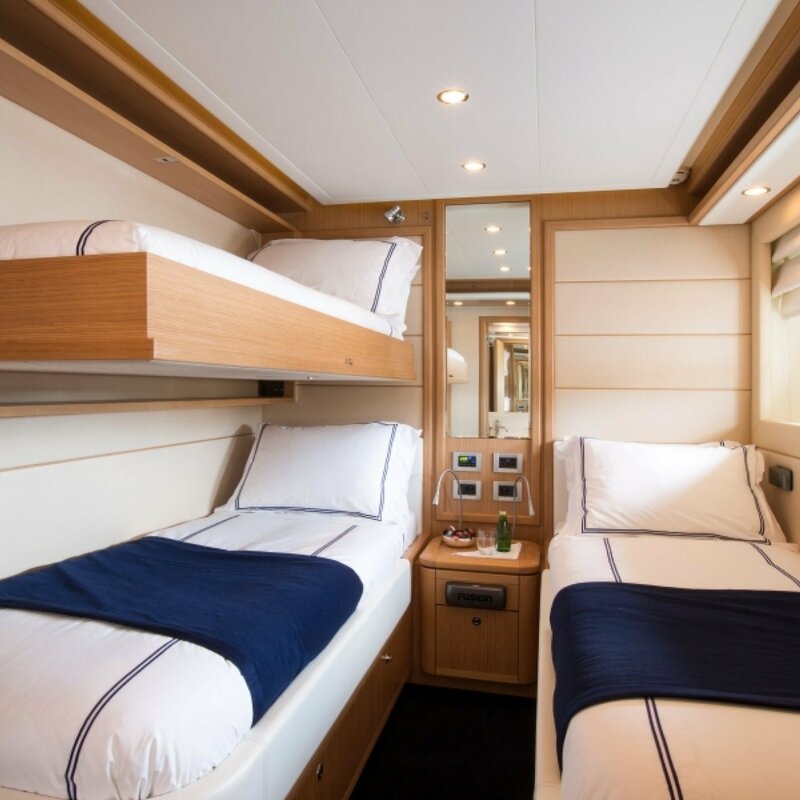 In the two twin cabins there is not a TV however there is a docking station built into the wall which will play music through speakers built into the room and there is a further charger on the bedside.